For me this one starts off really well and the whole idea of Arthur being the local independent candidate is great, standing up for his rights. That said, for me the ending is a disappointment and it all ends on a poor bit of dialogue in the Winchester Club and I just think it could have been done a bit better. The highlights of this one for me are Arthur's dialogue, Chisholm and of course the great Lennard Pearce who is the chief bigot ready to sign up for the return of old school crime & punishment when Arthur suggests it at the Winchester. We also see Jones smoking which is possibly the only time we do. Top line: they did wonders for my gout! This is not the greatest Minder episode ever but by no means the worst and it has some very good moments. Vote Daley. Yeah totally agree with you jno. Not the best episode, some good scenes, but not one of the best. It has one of my favourite bits at that start where Arthur misquotes the poem Leisure - he says "what is this life but full of care, we ain't got time to stand and stare" and then says "just a little thing I picked up in my reading". Wasn't the drunk journalist played by the same guy who played Del's father in OFAH? That said, for me the ending is a disappointment and it all ends on a poor bit of dialogue in the Winchester Club and I just think it could have been done a bit better. Arthur: I am collecting signatures for the return of capital punishment. Del's Grandad: What about the birch? ..did wonders for my gout! - I ain't seen anyone hung yet! - No, it's been put off till later. I quite like this one just for the fact Arthur was standing for a seat on the council, the mind boggles at how that could have turned out. The brilliant Lennard Pearce is in it also, in what was apparently the last bit of TV work he did before he died. The guy who played Kessler in Secret Army was in it also. 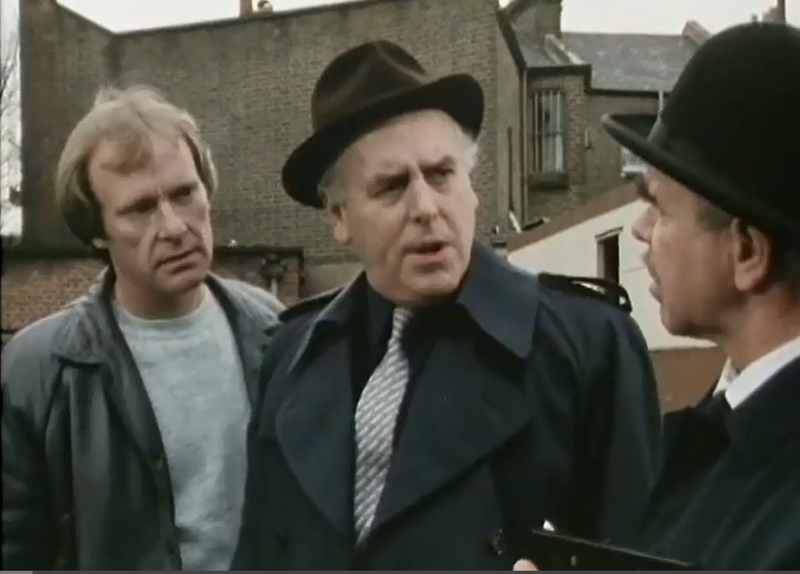 Minder didn't half get some very good actors to appear, must have been a badge of honour in the profession to have made an appearance in it. I also like the subtle misquote of Martin Luther King on the poster in the election meeting - 'I had a dream - A. Daley' - instead of 'have'. When you think about it it turns the quote into pure nonsense. Gave this a watch again last night and it is a nice little episode. Caroline Langrishe, a stunning woman and also another OFAH connection with Peter Woodthorpe who plays the Trotters father Reg in an episode, playing the drunken journalist trying to stitch up Arthur. As said previously, not the best episode of Minder ever, but it does have a lot of little moments in it which helps it rise above average. The part when he goes to the council offices to declare his standing at the elections and gives his speech to the sanitation department was classic Arthur, along with the run ins with the guy at the front desk of the council who berates him about where he is parked. Arthur playing drunk, or hungover and pops his head up from behind Terrys sofa, was yet another quality scene. Great line! Incidentally this was the second time Gout was mentioned in Minder...a cyber-Pint for the first to answer when! Arthur - "Have the Russians invaded? Are we all to be put in a chain gang digging the M25??" Arthur - Dead?? well, that's no excuse, he should have dealt with this first..."
As jno said, some brilliant Arthurisms in this one! The guy who hassles Arthur about his parking is played by Michael Ripper who starred in many Hammer horror films, often as an innkeeper in the obligatory creepy small village. 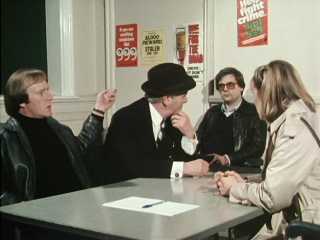 He also played a good role in the Sweeney episode "Stay Lucky Eh? ", the one where the robbers get robbed and a load of really good actors appear in it, Peter Vaughan, John Challis, Alun Armstrong, to name just a few. 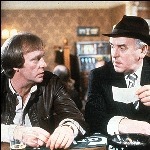 Incidentally this was the second time Gout was mentioned in Minder...a cyber-Pint for the first to answer when! Clue needed, I'm struggling to think of this and have been racking my brains - something tells me series 1-3 somewhere but could be wrong. "Mr West has gout, very painful..."
"Oohh...an intemperate man is he?" Ah, shame on me - "Car Lot Baggers" it is, I knew I shouldn't come orf my course of allopurinol too early! Saw this on Monday 25th Jan. for first time in years. But the ending was a real puzzle. Arthur says that the chocolates were for resale and it stops, just like that. He even says it like he is expecting a retort from one of the two guys telling him he will be disqualified. Indeed when I watched it tonight I thought ITV4 had clumsily cut off a bit but now I read this site (what a mine of information!) I realise they do not appear to have done so? Also, excellent spot about the drunken journo being Del's father in an OFAH episode! Knew I had seen him somewhere else but would not have remembered where. Don't worry about him, he's Welsh! I enjoyed this episode but I can't help thinking the idea of Arthur Daley entering politics should have made for a better episode. As it is it teeters on edge of very good and great. I know Caroline Langshire from the later episodes of Lovejoy and it was fun to see her with Arthur and Terry. George Cole vs Michael Ripper is a highlight. I also enjoyed Chisholm's silent burn at the political rally. You can almost see the steam coming out of his ears! Everyone rushing to sign Arthur's petition to bring back capital punishment was also funny. I agree that the ending was rushed. It almost seemed like George and Dennis were going to look into the camera and apologize for the blatantly sloppy ending. The episode is a solid 9 but is lacking the extra something that would have made it a 10. Series Five of Minder seems to find the program during what I call a "tired period". All longing running shows experience periods during their run when it becomes uneven and stumbles. The train keeps moving forward but not as smoothly or as fast. The Colin Baker era of Docfor Who is another example of what I consider a tired period. I've not watched the episodes for some time, so I can't comment much. I recall the one with Beryl Reid and Bill Maynard was a bit weak. You have to remember that series 5 was filmed straight after series 4, which may tell you why it was flagging after 20 episodes or so. - Arthur turning up at Terry s flat & disturbing his fling with a young lady ! of orange with matt black bonnet , parked at the roadside - which would be worth a fortune today ! The funny thing is, some OFAHs fans consider this to be an unofficial appearence of Grandad, as Leonard pierce plays the character of George with all of Grandads mannerisms and quirks and is dressed similar. Irony was it was his last TV appearence before he passed away,and it was in the show that was responsible for the creation of OFAH as well as it's rival! Very good episode. Interesting to know that David Yallop wrote both this and An Independent Man in 1996, which is almost a continuation of this. I imagine the political goings on here are very true to life. Caroline Langrishe is rather lovely. Interestingly, she was cast, and shot some scenes, as the kidnapped girl in The Professionals' Long Shot but was unavailable for reshoots so the part was recast with Judy Matheson. Meic Povey gets listed on the start titles for the first time. I can understand the ending not being everyone's cup of tea but it doesn't bother me. Bare trees make this another episode to be filmed in early 1984. Very good episode. Interesting to know that David Yallop wrote both this and An Independent Man in 1996, which is almost a continuation of this. Meic Povey gets listed on the start titles for the first time. Sadly 'An Independent Man' is not a patch on this episode though, the likeable characters of Arthur & Terry make this relatively tongue in cheek story come to life as always. It is great to Meic getting an official credit and by this time Chisholm and him were right up there as the captains of sub-plot. [The filming dates would have been the few months of 1984, more specific info to follow at a future date. Great cast. 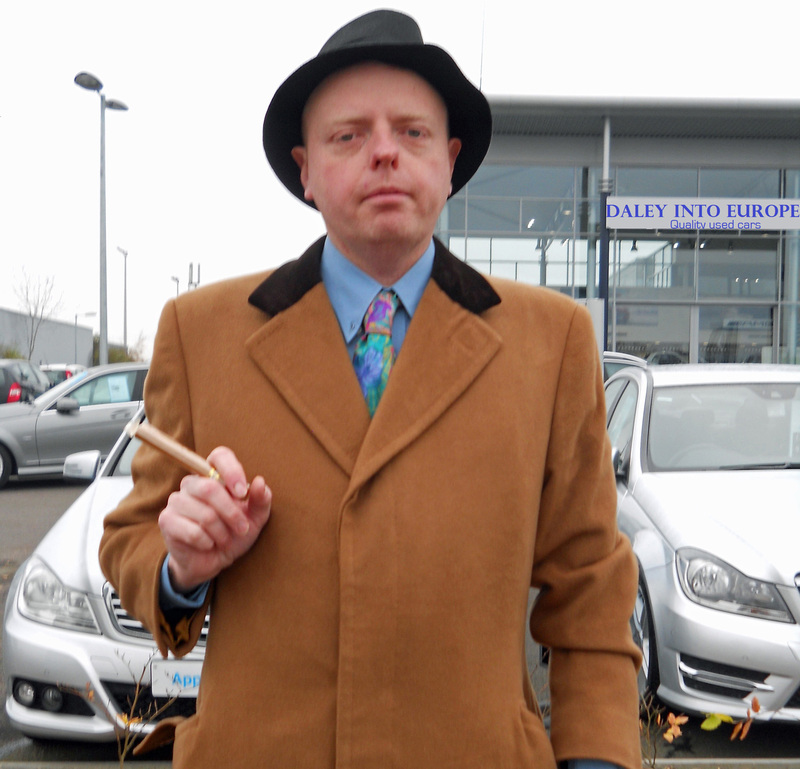 Nicholas Coutney, Michael Ripper playing a car park attendant! Leonard Pearce. Love Arthur's self righteousness. This wasn't the best but had quite a lot going for it. Was on ITV4 today. Definitely a Good episode and voted for it as such.